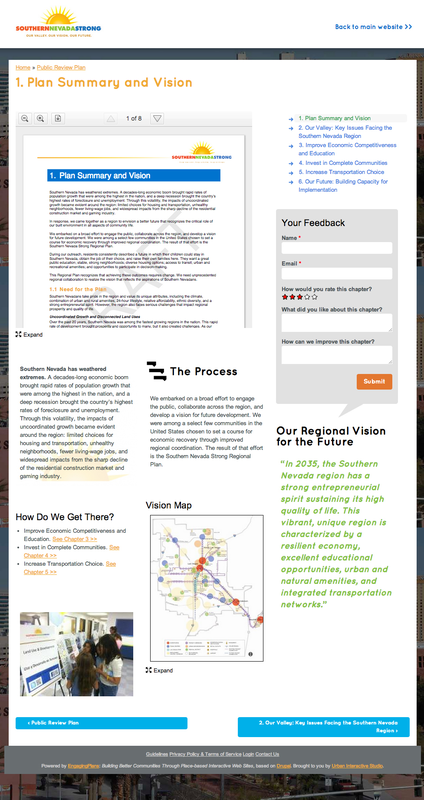 “Southern Nevada Strong”, a collaborative regional planning effort, seeks to build a foundation for long-term economic success and community livelihood by better integrating reliable transportation, quality housing, and job opportunities. To achieve these goals, citizen feedback is considered a key asset in drafting the final plan. Planning documents like the one put forth by Southern Nevada Strong can be hard for the average citizen to read and understand, let alone respond to. Published as unresponsive PDF files, these documents are usually read by only a handful of the population - leaving the planners with little informed feedback. Southern Nevada Strong sought a better way to present their documents to the public. The Draft Review app brings planning documents to life, making them interactive so people can easily explore, zoom, search, and respond to the information. For Southern Nevada Strong, the multi-page document is broken into sections, so users can easily navigate to information they care about. A response box on the same page makes it simple to provide feedback on the document with questions like “What items in this chapter should be the region’s priorities?” or provide a rating. Besides reading the actual document, users can browse summaries of each chapter, highlighted by infographic elements, charts, key quotes from the document, and other helpful tools to make the points memorable. Giving feedback is much easier when the information is easy to digest and understand. Southern Nevada Strong has published a planning document that makes citizens and stakeholders a part of the conversation. With feedback opportunities right beside the document, public responses will be more frequent and more informed. Those are the key ingredients to a successful final draft. Meanwhile, the region also gains a reputation for communicating well with residents and making information available in a meaningful format. In this day and age, it’s a surprising that so many documents are still published in a static format using decade-old technology. But, organizations like Southern Nevada Strong are stepping up to bring their documents into the 21st century, and are reaping the benefits. Learn more about the EngagingPlans App Suite or request a quote for your project!